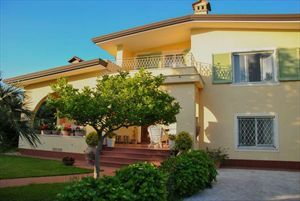 A new, modern, detached villa (170 m2) with a well-tended garden (900 m2) is located in a quiet area in the central part of Forte dei Marmi, at a distance of about 900 meters from the sea. The basement has a living room, kitchen, dining room, laundry room and a shower. On the ground floor, there is a living room, dining room, kitchen with dining area and access to the terrace, single bedroom and guest bathroom. The house is fitted with air conditioning, alarm system, internet Wi-Fi. The garden features barbecue area and a covered parking for 3-4 cars.